This view represents an improvement in resolution of nearly three times over the previous Cassini images of Titan. 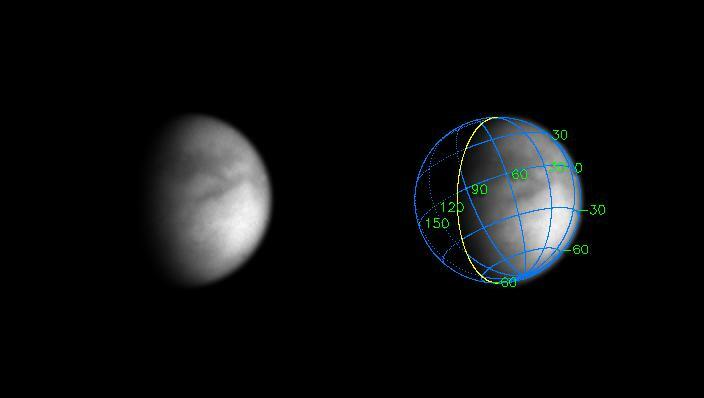 Titan's surface is difficult to study, veiled by a dense hydrocarbon haze that forms in the high stratosphere as methane is destroyed by sunlight. This image is different from previous Titan images by Cassini because it was taken through a special filter, called a polarizer, which is designed to see through the atmosphere to the surface. 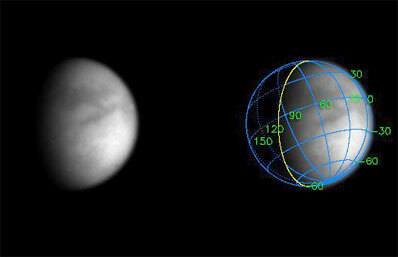 The superimposed coordinate system grid in the accompanying image at right illustrates the geographical regions of the moon that are illuminated and visible, as well as the orientation of Titan. North is up and rotated 25 degrees to the left. The yellow curve marks the position of the boundary between day and night on Titan. This image shows about one quarter of Titan's surface, from 0 to 70 degrees West longitude, and just barely overlaps part of the surface shown in the previous Titan image release. Most of the visible surface in this image has not yet been shown in any Cassini image. The observed brightness variations are real, on scales of one hundred kilometers or less. The image was obtained in the near-infrared (centered at 938 nanometers) through a polarizing filter. The combination was designed to reduce the obscuration by atmospheric haze. The haze is more transparent at 938 nanometers than at shorter wavelengths, and light of 938 nanometers wavelength is not absorbed by methane gas in Titan's atmosphere. Light at this wavelength consequently samples the surface, and the polarizer blocks out light scattered mainly by the haze. This is similar to the way a polarizer, put on the front of a lens of a hand-held camera, makes distant objects more clear on Earth. Cassini will conduct a critical 96-minute burn before going into orbit around Saturn on June 30 (July 1 Universal Time), with its first scheduled flyby of Titan on July 2.